Southern Peony: 2018 Southern Peony Celebration Intersectional Peony ??? 2018 Southern Peony Celebration Intersectional Peony ??? 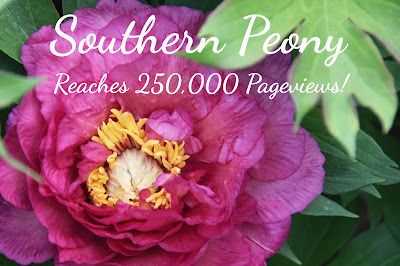 To help us celebrate our recent milestone, 2018 Southern Peony Hits 250,000 Pageviews! !, we are giving an intersectional peony to one lucky reader. It is the one pictured in our celebration photo. Can anyone guess what interesectional peony it is? Here are a couple more photos as a hint in case you need it... This really is an awesome intersectional peony, and I'm really excited to share this peony with a Southern Peony fan. The first two photos here are taken in the sun, and the last one is taken in the shade, just as the bud started to open. So you can see what a beautiful color range this peony has (and what a difference sun vs. shade makes in photographs!). If you are interested in winning this intersectional peony, be sure to sign up for our email newsletter. The winner will be drawn at the end of this week, March 31, 2018, and the intersectional peony will be shipped bare root this fall. Looks like Hillary but I think it's Keiko. It is Intersectional Peony 'Hillary'. Thank you for your guess!